The night has arrived. 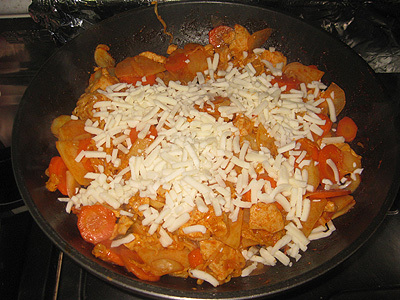 My mission: to recreate the delicious dak galbi we have in chonbukdae. 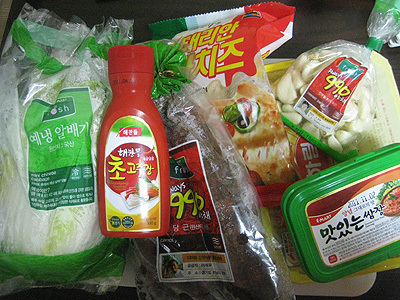 I assembled the ingredients I needed for my mission: chicken breasts, cabbage, a carrot, a potato, garlic, ramyeon noodles (ramen — better than the American stuff), mozzerella cheese, red pepper sauce with vinegar, seasoned soybean paste (not called red bean paste — news to me), and lettuce leaves. 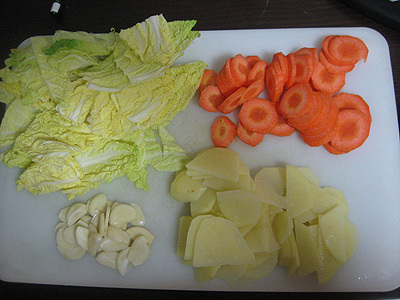 I gave the veggies a quick chop. 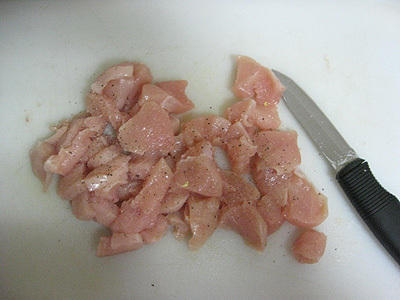 Next, I sliced my chicken on the cutting board, seasoning liberally with salt and pepper. 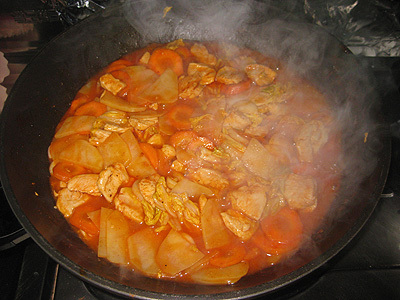 Then the chicken and veggies went into the pan with some water and a liberal amount of the hot pepper sauce. 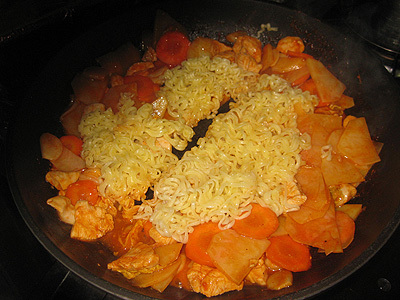 As the food cooked and the sauce thickened, I dropped the ramyeon into water to boil for a few minutes. 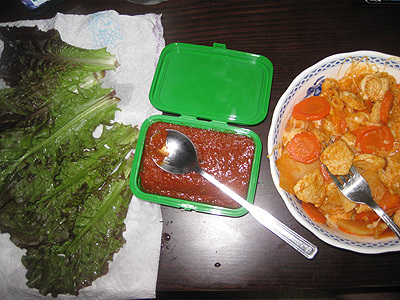 The food mixture turned a lovely shade of red — spicy! As soon as the noodles were ready, I added them into the pot. At that point I was seriously drooling. Finally, the cheese went in and the mission was over! 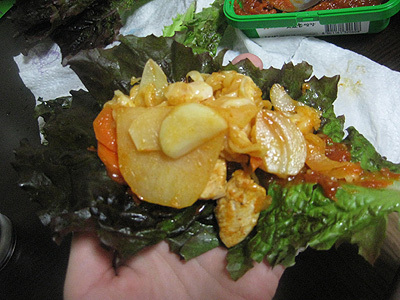 I arranged the washed lettuce leaves on a paper towl, the seasoned soy bean paste next to that, then the bowl of dak galbi — now came the real test. Did I do it? You know I did! The pepper sauce was perfect, and I made this towering “taco” with an ice cold lettuce leaf, a shmear of bean paste, and a big scoop of chicken, veggies, noodles and cheese. I almost didn’t take the picture because I was busy shoveling food into my mouth. Recipe success! A definite repeat. Delicious! Interesting that they use cheese on noodles…I wouldn’t have expected that! You leave me s.t.a.r.v.i.n.g. You totally have a job when you come back! 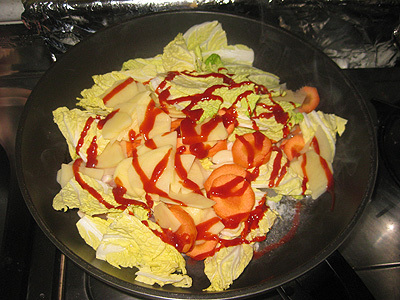 Cooking me this food….I am salivating!